The accommodation platform 'West Gamma' was hit by a violent storm on the 20 August 1990. Every crew member was saved. At 3 a.m., the platform chief on board the West Gamma, Olav Benjaminsen, contacted the “Esvagt Omega” over the platform radio. Master, Hans Andreasen, who had been appointed ’on-scene-commander’ in case of a rescue operation, took special note of the radio message. He had been talking to the platform chief more and more often over the last 24 hours since the “Esvagt Omega” and “Protector” had been released from the Dan field to aid West Gamma’s fight against the August storm. They had gone through all the scenarios and now there was nothing more they could do. “The platform chief said that they were going to have to jump into the water. I promised him that we would be ready,” says Hans Andreasen. The crew on the platform were told to tie themselves together in groups of five to make it easier for ESVAGT to find them and to make sure that everyone was retrieved from the water. The “Esvagt Omega” readied the FRB and Hans Andreasen appointed first mate, Leo Frederiksen, responsible for the boat. “We knew where this was heading an hour before the master’s message. 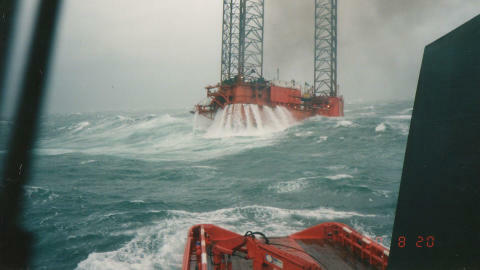 The waves were 10-12 metres high and the rig was listing heavily. We knew that something was going to happen soon,” says Leo Frederiksen. When the message came, he quickly got ready. “I was tense but not afraid. There was not much time for thinking. We could see that they had started sorting themselves into groups at the aft of the rig,” says Leo Frederiksen. The crane launched the FRB onto the waves and Leo Frederiksen manouevred it behind the platform and gave the signal for the first group to jump into the water. The first five jumped in. “We soon reached them. They were tied together so when Allan and Nicolai grabbed the first man, the next man was already on the way up. It was heavy but it worked,” says Leo Frederiksen. He sailed back to the “Esvagt Omega”, got the rescued crew on board and returned for a new group. Time after time. “None of us knew how many trips we had made or how many we had saved. We were completely focussed on the task: sail to the light from the helicopter’s projector, give the signal to jump and then retrieve the men from the water,” says Leo Frederiksen. Asbjørn Rislaa, master mariner and crew member on board the West Gamma, followed the rescue from the water. “When the FRB came alongside the “Esvagt Omega”, it took just a short moment to hook on and we were at deck height in no time. Others took a good, strong hold of us and welcomed us on board”. Leo Frederiksen's FRB saved 30 men from the North Sea on the night that the West Gamma sank. He is now master on the 'Esvagt Delta'. ”You will have to wait a bit for your cigarette break. The “Normand Drott”’s FRB has just capsized with 12 people on board and we need to pick them up,” he said. So it was back to the water, remembers Leo Frederiksen. Two more trips later and the FRB with Leo Frederiksen as its lead had retrieved 30 people in total from the North Sea. Two of them crew members from the Norwegian FRB. All 49 on board the West Gamma were saved. In addition to the 30 people saved by the “Esvagt Omega”, a further 16 were saved by the crew of the “Protector”. 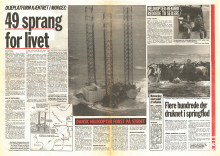 Lars Knudsen, chief officer of the “Protector” remembers how the saved crew members reacted. “Another one clung onto the toilet all the way back to Esbjerg. Others just sat and stared. Most preferred to be on the bridge where we were,” says Lars Knudsen. “We were all offered clean, dry clothes and I lost count of how many times we were asked if we were ok: Would you like a cup of coffee, some water, seasickness tablets, would you like to lie down? 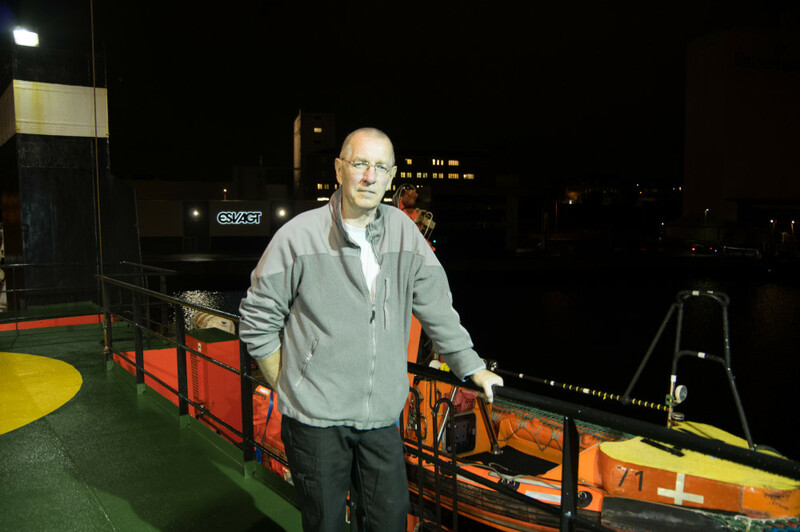 The crew was very caring and keen to help,” says Asbjørn Rislaa. “Some of the rescued people were crew from the Norwegian tow boat and their master wanted them back. We said that he could pick them up in Esbjerg. 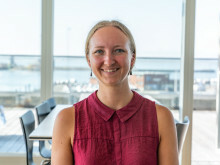 Everything had gone so well and there was no need to take any unnecessary risks,” says Hans Andreasen. The vessels reached Esbjerg the following morning and were greeted by a myriad of press, police, colleagues, families and the curious. The crew made their reports at the shipping company, slept for a few hours and then headed off again to the Dan Field. The subject of conversation on board circled round events and evaluations: What had happened, what went well – and why? “We were pleased and happy but we did not feel especially fantastic or brave. It is not courage that rescues people – it is training and equipment,” says Leo Frederiksen. That is how Asbjørn Rislaa experienced it too. “I must praise the Danish seamen; they could have done nothing better from beginning to end. Thank you for working in such an admirable way,” he wrote. Hans Andreasen remembers the sense of assurance throughout the entire operation. “We had the training and the experience – and Leo was clever. I was in no doubt that we would succeed,” says Hans Andreasen.